I can’t wait to break out my spring wardrobe either! Just itching, lol. This looks super creamy, Leanne! Loves me some avocados so this is definitely made for me! And cashews are really a wonder ingredient! No one will miss dairy in here at all 🙂 This and some garlic bread? Oh yeeeeeah! Im hoping for warmer weather as well! 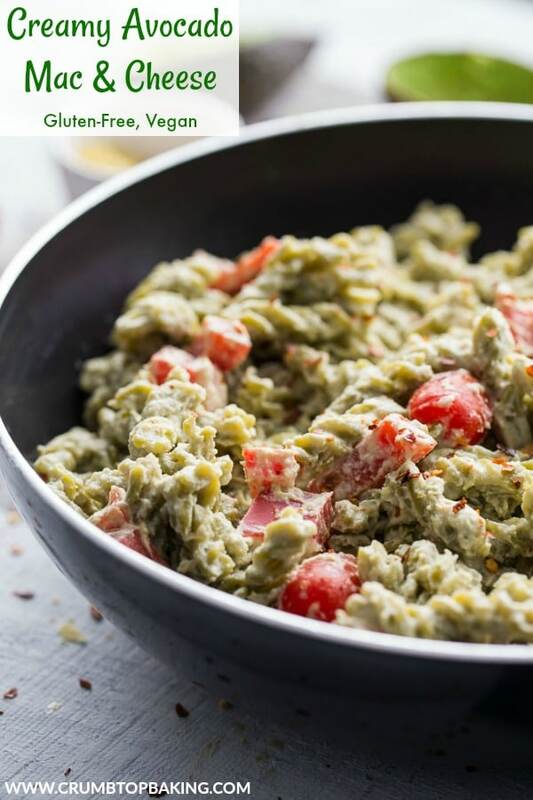 This looks so creamy and delicious, now if avocados just weren’t so darn expensive! I think I would make this every day. Thanks Patrick! I go through a lot of avocados in the run of a week, so I would love for them to be cheaper! Here’s hoping spring shows up for both of us soon! I’ve never heard of vegan Mac and cheese! This looks amazing…can’t wait to try it. Thanks so much! I hope you like it. Be sure to let me know what you think if you make it! Pinned for later! I am in love with this dish! YUM! Thanks Kim! Hope you’re having a great weekend! I’ve never tried cashew cream but I may be doing so soon…dairy may be the culprit for some issues I’m having. Aren’t those fun?? I love that you added avocado and I’m sure I wouldn’t miss the dairy here! Yes, dairy can be quite the culprit and those issues are always delightful!! I’ve been eating a lot more avocado since I’ve cut back on dairy, and I’m loving it. The cashew cream is a nice dairy-free substitute as well. Let me know what you think if you give it a try! Happy weekend Marcie! No ice cream!? Poor you 🙁 At least you can make up for it with this creamy dish!! 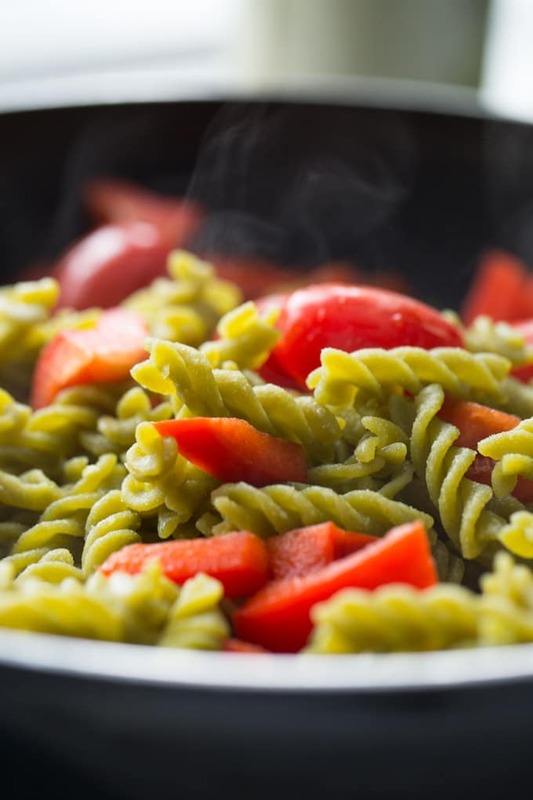 I can’t wait to try it – I love stuffing all sorts of healthy things into a dish, and pasta is always a win around here! Yum! PS – still freezing here, and it’s actually snowing at the moment!! Seriously, I’ve never clicked on a post so fast in my entire life. 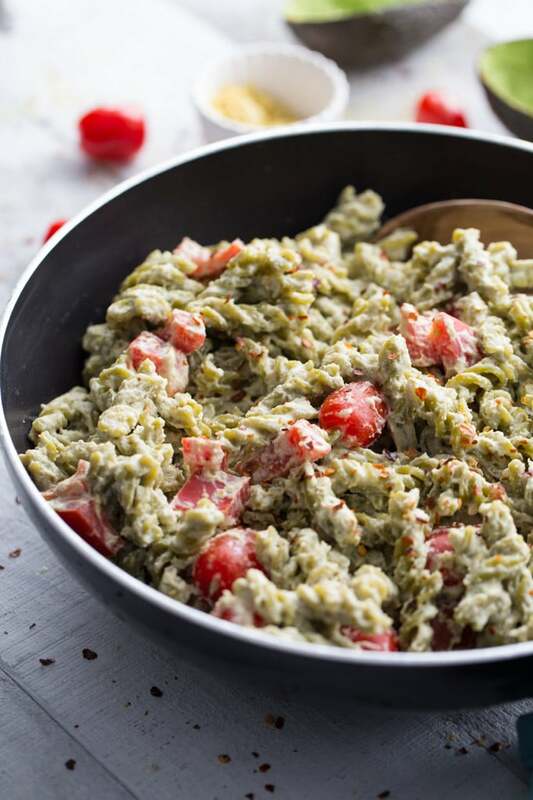 The moment my eyeballs read Creamy Avocado Mac and Cheese my brain said, “Christina, you click on this post and save this recipe RIGHT NOW!” And seriously, your food photography is simply stunning! Thank you Christina! You are always so kind with your comments! :) I hope you get to try this one. I would love to see your take on this recipe. Happy weekend! – I am drooling over this dish and it’s 10 am! No shame I could totally have some. I’m pinning it for later. – Never had nutritional yeast and quite curious to try after reading your description of its taste. Bonus thing lol – So so glad I did FBC thread after month to discover such a nice blog! Thank you Melanie! So glad I found your blog through FBC too! Be sure to let me know what you think of nutritional yeast if you try it. And I’d love to know how you incorporate it into your recipes! Happy weekend! 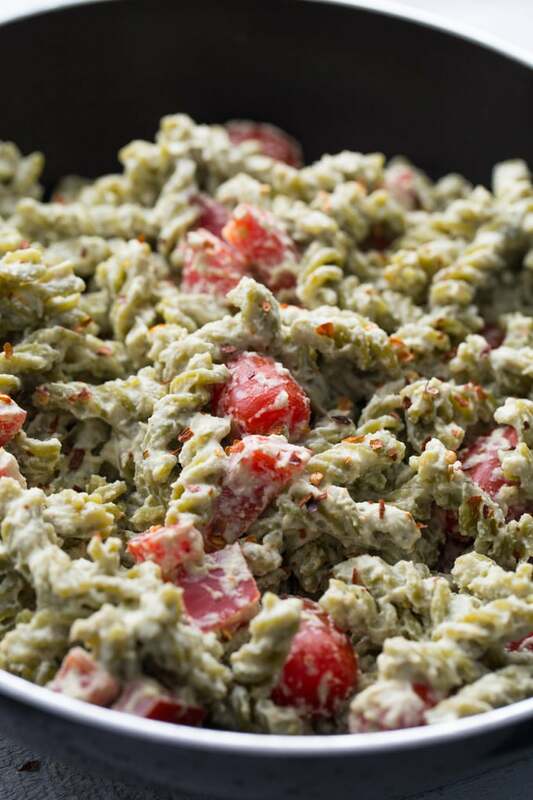 I love mac’n’cheese and what a good idea to put avocado in it! It’s looks soooo creamy! I’ll try for sure! Thank you for the recipe! Thanks Nathalie! The avocado makes this pasta dish extra creamy. Hope you like it! 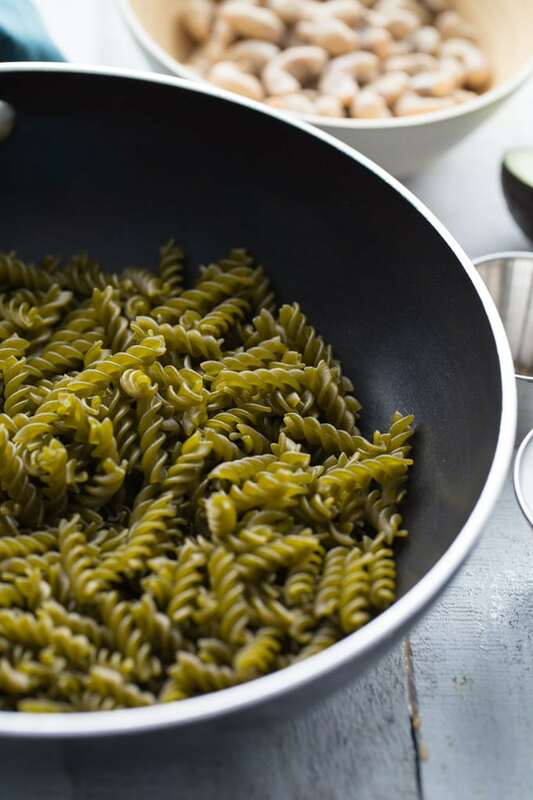 Love the green pea rotini (which we call fusilli 😉 ). And also love the creaminess obtained with the cashews, almond milk, avocado and nutritional yeast. Super comforting and healthy! Thanks Nicoletta! I definitely love this dish for all its whole ingredients, but the creamy texture is a lovely bonus! I just so happen to have avocado on the counter waiting to be used! This looks delicious! It was meant to be! Thanks Annie! Hope you’re having a great week! 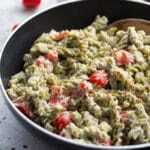 This is a creamy spring delight… it looks sooo delicious.. Well, This is also true that i never tried cashew sauce yet. 🙂 I will try this for sure.. Thanks Priya! The avocado sauce makes this pasta super creamy. Let me know what you think if you try it! It looks delicious! I haven’t tried pea pasta. I have been put-off by the texture of rice pasta which has led to me to be suspicious of anything that is not durum or semolina flour. I’ll look for it in the grocery store. 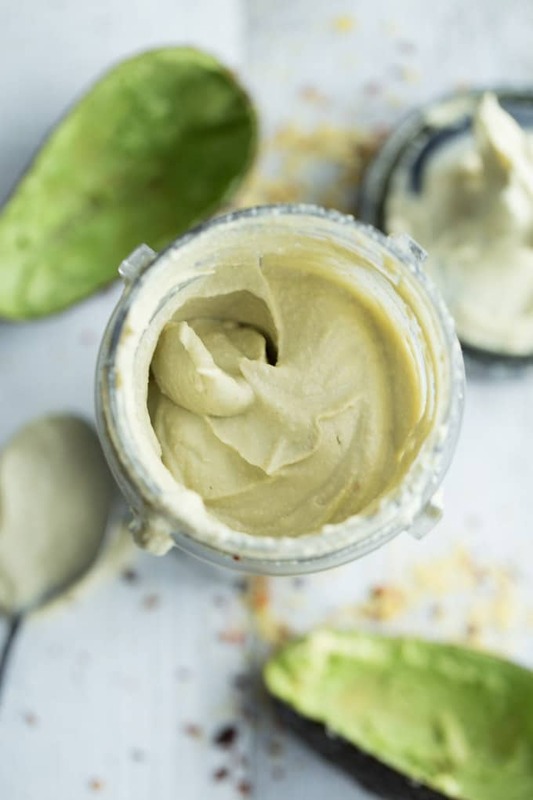 I am a big fan of cashew cream! Thanks Shauna! I’m new to pea pasta, and really like it, but I imagine it wouldn’t be for everyone. It does have a slightly different texture than regular pasta, and it really tastes like peas!! 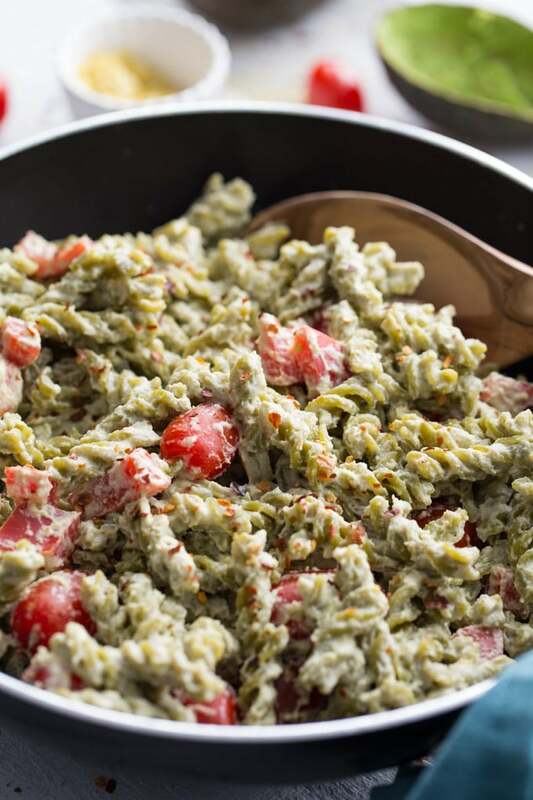 I’ve never tried rice pasta, but I’m adding it to the list to give it a whirl!